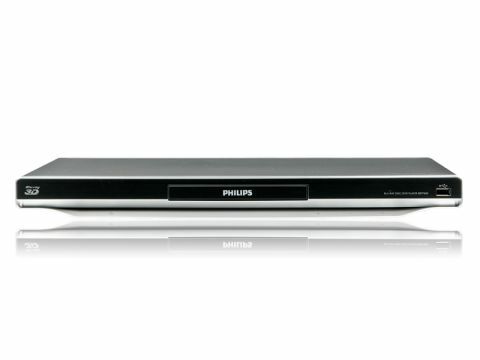 Philips has created a thing of beauty with its 7 Series 3D Blu-ray deck. Finished in a greyish-silver and sporting a sculpted lip with illuminated soft-touch buttons, it's a real step up from the humdrum. The company has long advocated online connectivity for its gear, famously launching its own Connected Planet product line back when most of us were still getting online with steam powered modems. The brand was way ahead of its time. Philips' Connected Planet strategy faltered and now it's being forced to play catch-up. However, rather than create a walled-garden of IPTV like its rivals, the Dutch giant is endeavouring to establish a common standard of sorts, called Net TV. This loose confederation of entertainment services will also be offered by Loewe and Sharp on selected product lines. The smorgasbord that is Net TV is accessed via a simple grid system. Buttons lead through to an App Gallery where you'll find the BBC iPlayer, YouTube, Picasa, Twitter, TuneIn Radio and CineTrailers. Apart from the free VOD, paid streaming channels are also available, including Cartoon Network, Box Offi ce 365 and Hit Entertainment. You can add more content to the launch page from the frugally stocked apps store. If you've been looking for a French language news channel, or a wallpaper screensaver of classical art, then you're in luck. Perhaps the best supplemental content service currently on offer is iConcert; this has a broad range of music videos on tap which can be searched by artist or genre. The streaming clips may be in SD but they look pretty good. If you want to venture out into the open web, the BDP7600 also offers a browser, but it lacks Flash support. While only one HDMI output is offered, there are 5.1 analogue outputs, which can be used to route lossless multichannel sound to a legacy AVR. This 5.1 output can be bumped to a 7.1 if you re-assign the separate stereo AV outs to the group. The unit doesn't have any persistent memory, so you'll need to add your own. Unusually, this has to be done in the form of an SD card rather than USB. Remember, though, that the rear-placed card slot doesn't permit playback of media. For that you'll need to use the front-mounted USB. Media streaming support is excellent. The player successfully accessed all our test files across a network, including AVIs, MOVs and MKV wrapped material, and also played them direct from USB. Audio support covers WMA, MP3, WAV and AAC, with album art when present. Not as green as some of its rivals. Not as impressive as Panasonic's DMP-BDT310, but a low figure that suggests good component quality and system design. Quick to spin up our resident disc, but takes a while to boot. When it comes to disc playback, the BDP7600 doesn't disappoint. Blu-rays look suitably detailed, with smoothly gradated colours and scads of texture. The player's two-channel audio presentation is also above average, making this a good choice for CD fans. The BDP7600 is the fastest loader in our group by the tiniest of margins, but takes a while to wake. It should also be noted that our test sample ran extremely hot. The right rear underside of the unit became uncomfortably warm after just a few hours use.